Tom was a lifelong native of Florida. and Christine has resided in 20 different countries and states, including Thailand, Germany and Okinawa. Tom wanted to live in the mountains, and Christine wanted to live by the ocean. They both fell in love with the Southern Zone of Costa Rica where the rain forest mountains kiss the Pacific Ocean. In 2008, they bought a gorgeous ocean-view mountainside property, and built their dream home. Tom has over 28 years experience in overhead/underground electrical line construction/repair, Christine is an independent business owner in the financial services industry since 1983. Ann Marie was a long-time resident of Texas, and worked in property management for over 30 years. Along with her husband Kevin, they have also personally owned and managed 25 rental properties. She moved permanently to the Southern Zone in 2016, and we are very blessed to have her as the newest member of the Jaguar Team! Ann Marie will be working side-by-side with Christine in the office, and in the field performing inspections and guest check ins-outs. Over the years, getting to know the local community and our neighbors, we realized that many owners were repeatedly disappointed by the lack of service from successive property managers and maintenance providers. Some owners unfortunately experienced being taken advantage of, not getting the service they were paying for, or were frustrated by the lack of communication and understanding of their requirements. There was a real need for a reliable, honest team that listens, and truly cares for clients needs and their properties, rental guests and homes. We are hard-working folks that take pride in delivering the highest level of service, and enjoy making our clients and guests happy, and feel at ease. Our different skill sets and experiences blend in a "cover-all-the bases" team approach. Our goal is to have happy, satisfied, referring clients and guests. 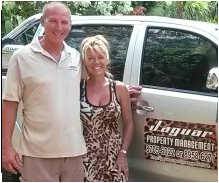 Jaguar Property Management is here to serve you, and provide the peace of mind that your home and your guests are taken care of as if they were our own. We have exciting news to share with you...due to the growth of our business, in our fourth year/2016 Jaguar Property Management is growing to serve it's clients better! To enable us to continue to provide excellent customer service for our growing number of clients, we are very pleased to announce that we have added another experienced professional to the Jaguar team, Ann Marie McWillis! This synergy creates an even greater powerhouse of knowledge and skill sets that will benefit our clients, and expands our service credentials. We live ful-time in Bahia Ballena and Ojochal, and currently manage properties in the communities of Dominical, Escaleras, Uvita, Bahia Ballena, Ojochal and Tres Rios. We invite you to contact us today for more information about our services!